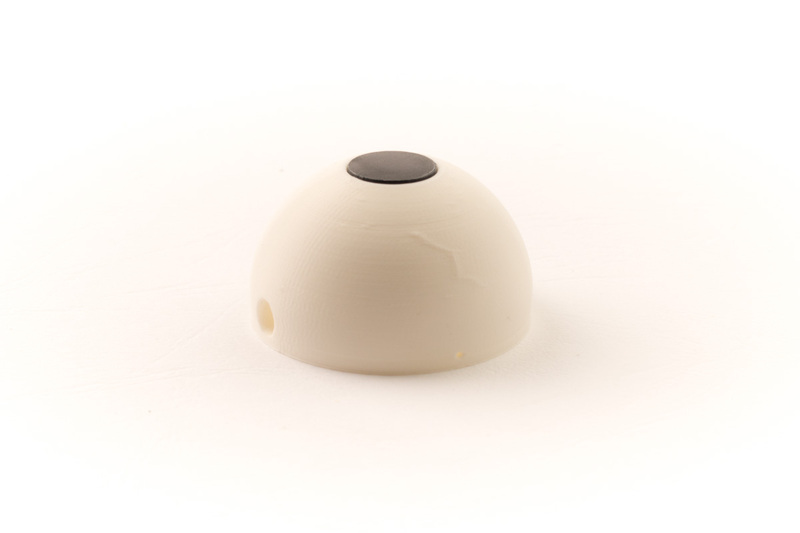 The eye module is one of the most complex modules of the Opsoro platform. 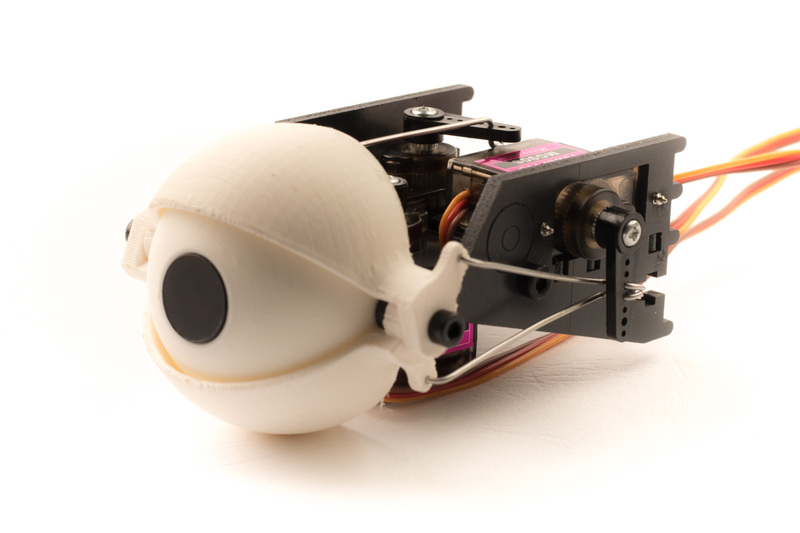 It implements a 3-DOF eyeball in a small and compact package. 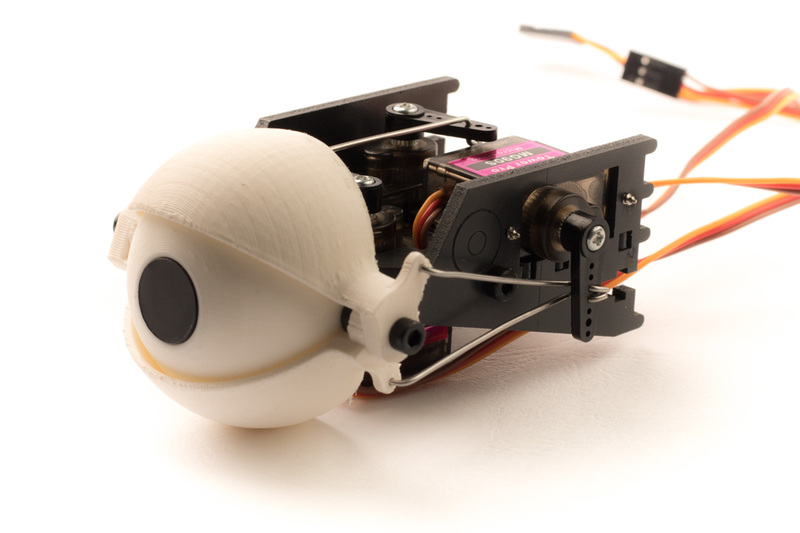 The eyeball itself can move up/down and left/right. 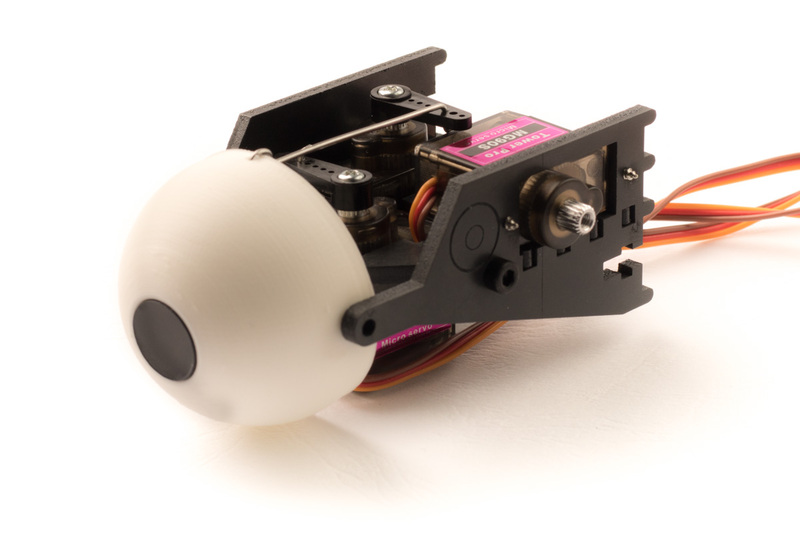 The eyelids of the module are actuated by a single servo. 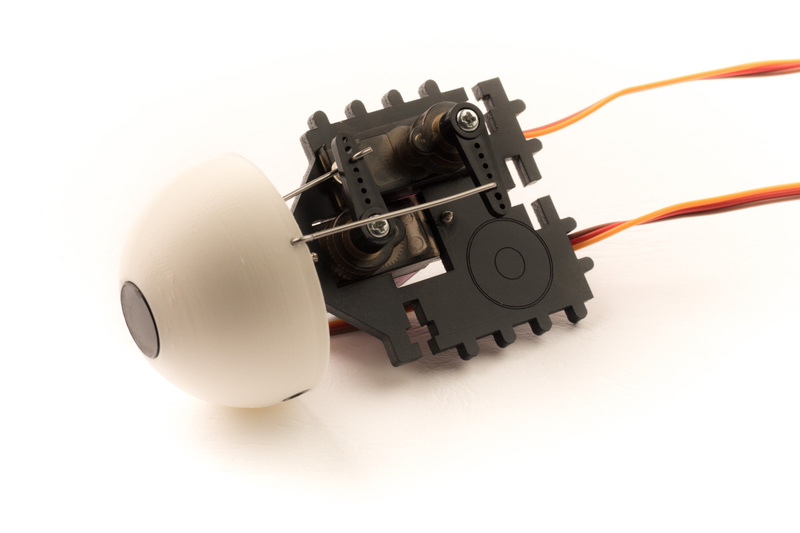 The eye module can be attached to the grid using a single M3x10 cap screw. Assembling this module can be tricky, so we advise you to take your time and to read the instructions carefully. 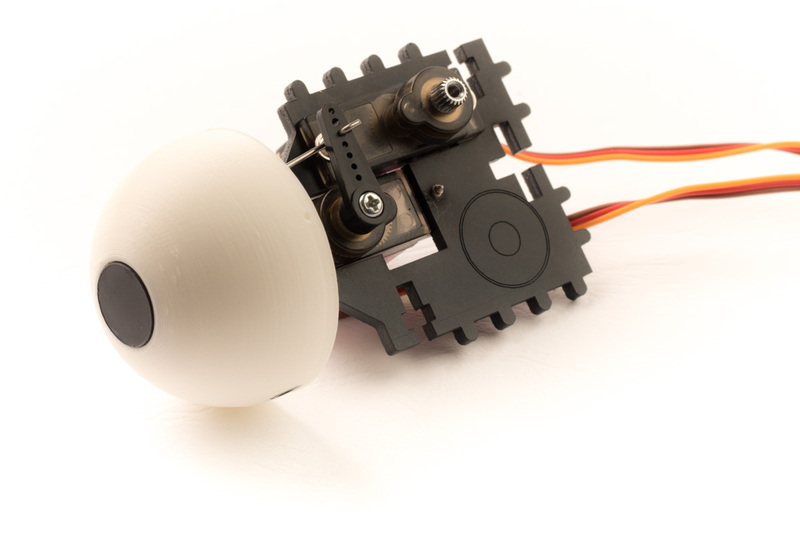 Clean and deburr the 3D-printed eye shell. 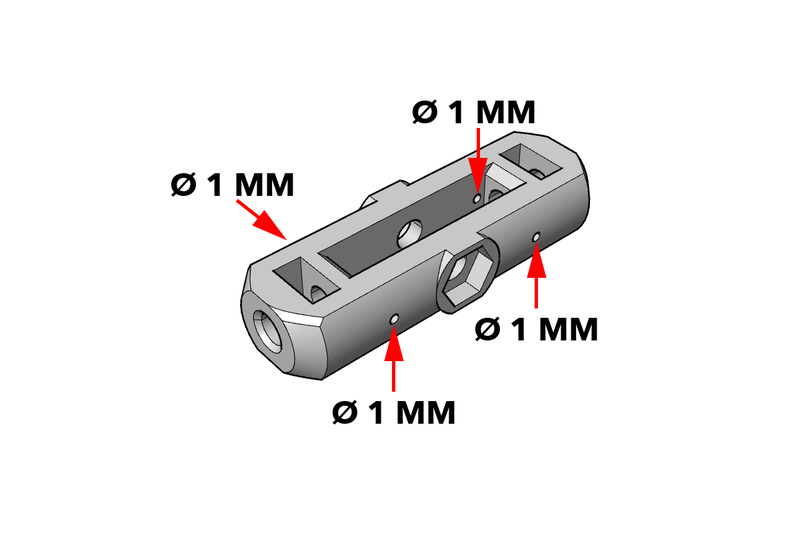 Use a cordless drill to drill out the holes to the specified dimensions, as shown in the figure. Deburr the edges of all the holes and use a file to remove any remaining print defects. 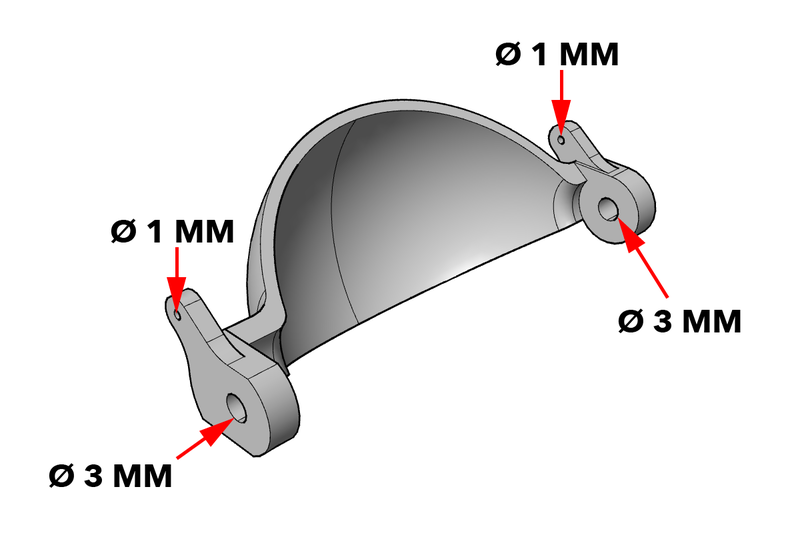 Use diagonal cutters to remove the support from the two 3D-printed eyelids. Clean and deburr the two parts. Use a cordless drill to drill out the holes to the specified dimensions, as shown in the figure. Deburr the edges of all the holes and use a file to remove any remaining print defects. The eye module requires two eyelids, so be sure to do this step twice. Clean and deburr the 3D-printed pivot beam. Use a cordless drill to drill out the holes to the specified dimensions, as shown in the figure. Using a pair of needle-nose pliers and a pair of flush cutters, bend the 0.8mm steel wire to form the four push rods of the module. Use the template above as a guide. Print out the drawing at 1:1 scale. The PDF of the drawing can be found here. 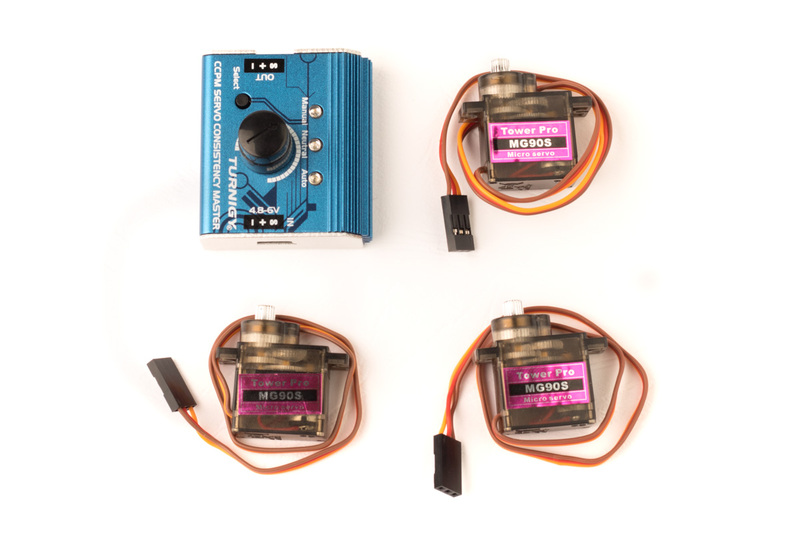 Use a servo tester to set the three servos to their neutral position. The process is described here. Insert the laser-cut iris into the eye shell. The iris should snap into place and should be flush with the surface of the eye shell. Some force may be required to snap the iris in place. 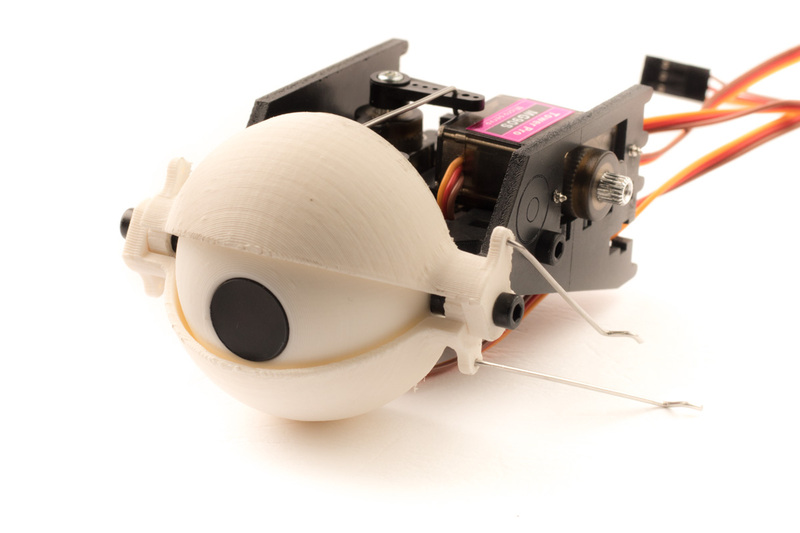 The easiest method is to put the iris down on a table and push the eye shell over it, pushing with your thumb from the inside of the eye shell. Start by inserting the nut into the hexagonal opening of the pivot beam. Insert the tip of the M3x10 screw through the opposite hole. Make sure you add the two washers. They are needed to create a low-friction pivot point. Do not over-tighten the screw, make sure that the pivot beam can turn freely. Attach the shortest push rod to pivot beam. Use needle-nose pliers to insert the wire into the correct hole. There are two holes in the pivot beam. Pick the one to the left, as shown in the picture. Insert an M3 nut into the rectangular opening of the pivot beam, then add a washer on the opposite side and secure everything in place with an M3x10 screw. Repeat the same process for the opposite side. 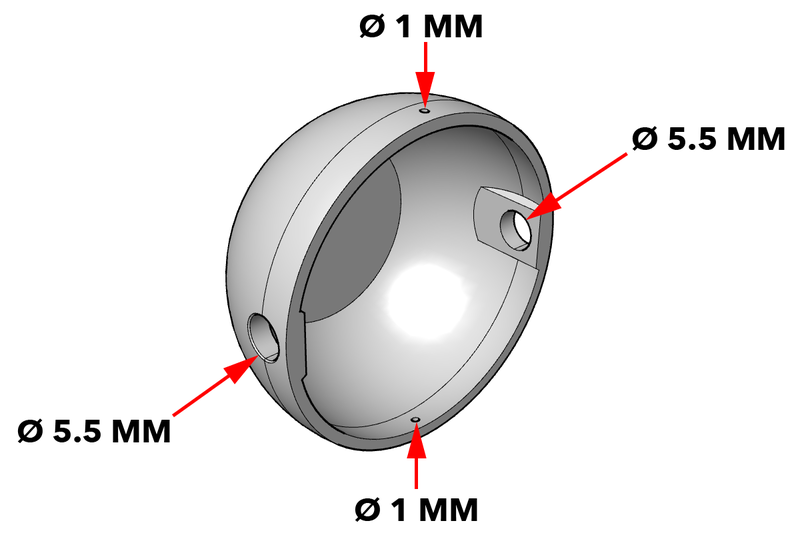 The screw heads of the M3x10 screws will serve as the pivot point for the eye shell. 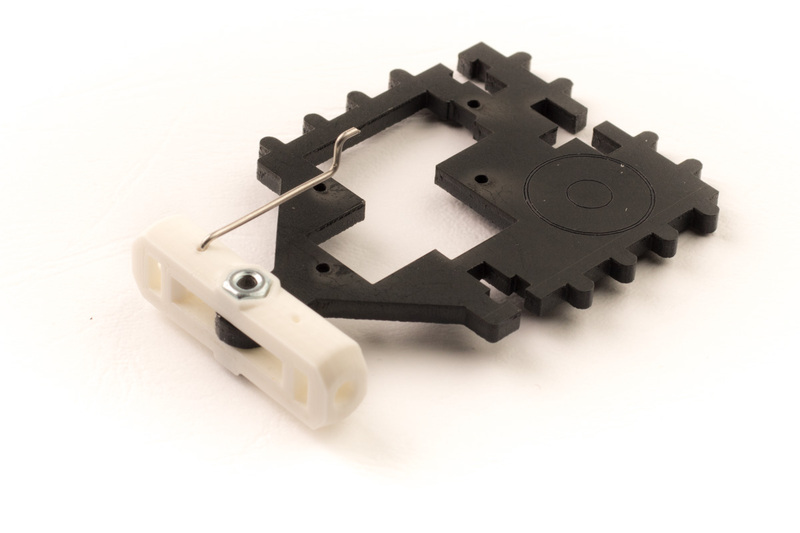 Attach a micro servo to the mid plate using the two included screws. Mind the position and orientation of the servo. The servo should be inserted from the bottom of the module. The shaft of the servo should face the front of the module. Attach the push rod to a servo horn. The rod should slip through the third hole (counting from the tip). 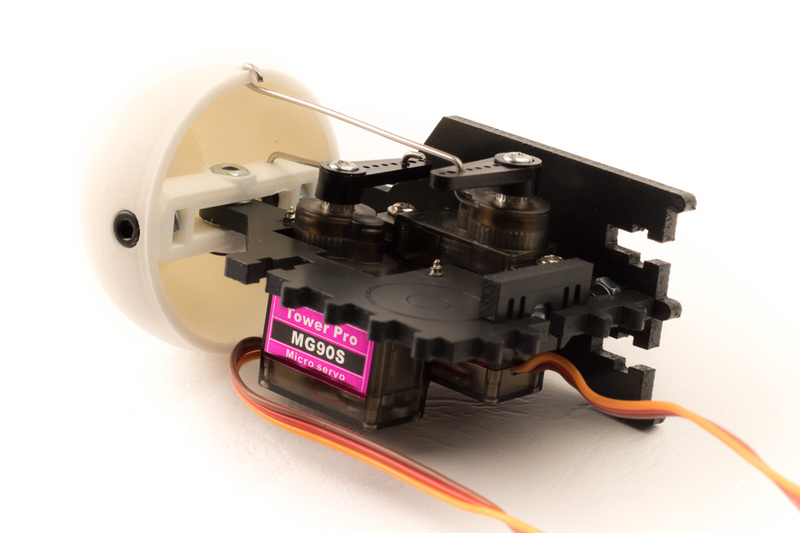 Then, attach the servo horn to the servo and secure it in place using the included screw. Make sure the servo is centered before attaching the servo horn. Attach the second servo to the mid plate. Position the servo as shown in the picture. The servo should be inserted from the top of the module. The shaft of the servo should face the back of the module. Attach the eye shell to the pivot beam by squishing it slightly, and then slipping it over the cap screw heads of the pivot beam. Make sure the eye shell can rotate freely. Attach the longest push rod to the top hole of the eye shell. Squish the end of the push rod with needle-nose pliers so that the push rod is completely flush with the surface of the eye shell. Slip the other end of the push rod through a servo horn. The rod should be attached to the third hole, counting from the tip. 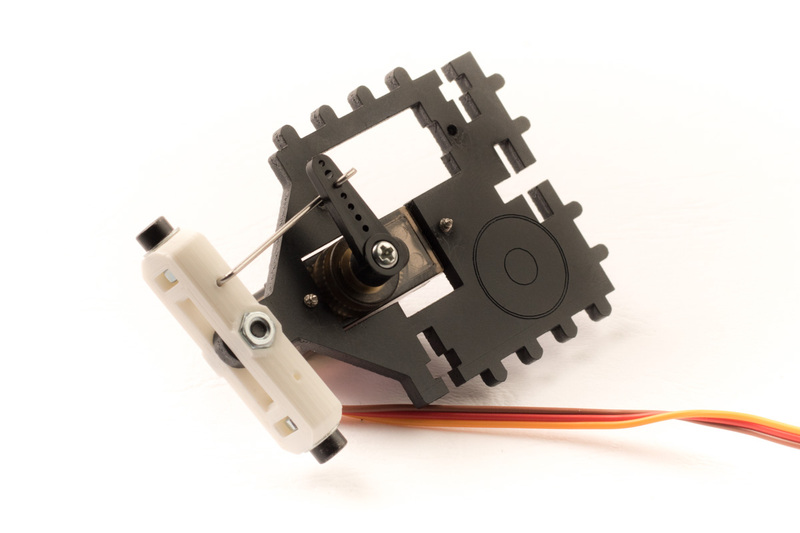 Attach the servo horn to the servo&apos;s output shaft using the included screw. 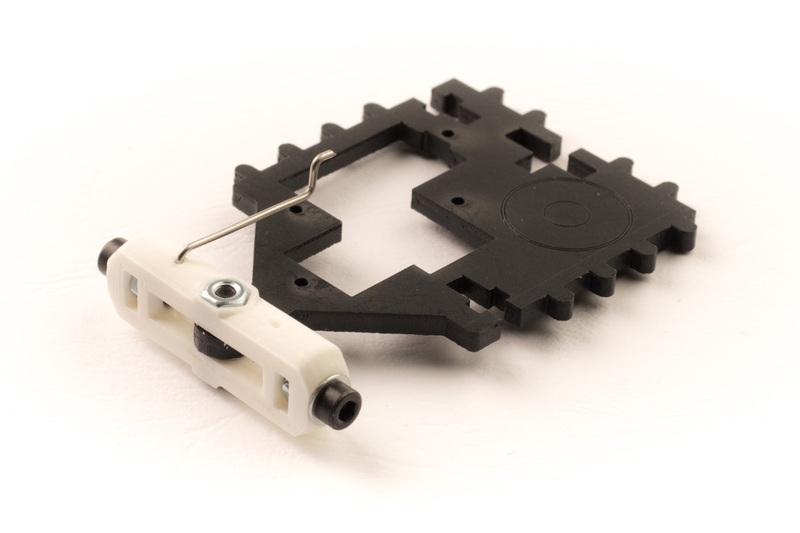 Insert an M3 nut into the back clip component, then snap the back clip and the nut into the mid plate of the module. 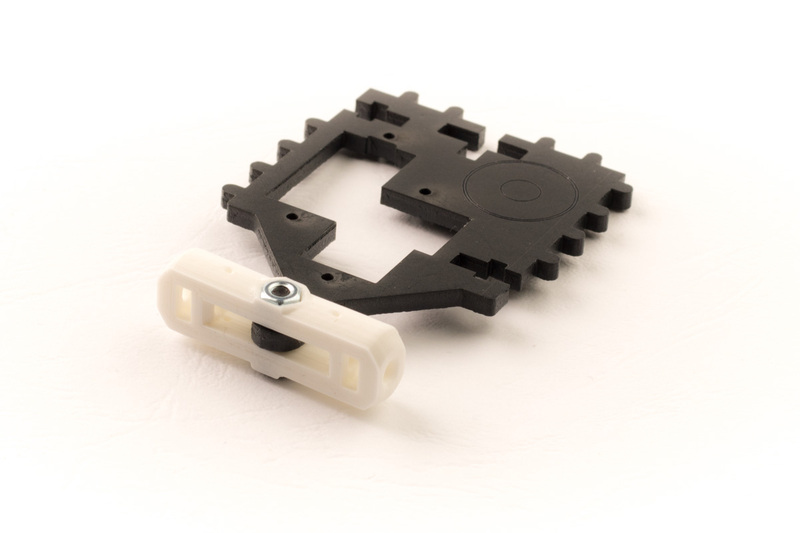 Attach the side plate without opening to the mid plate using an M3 nut and an M3x10 screw. Mind the orientation of the component. The horizontal edge of the side plate should be on the top side of the module. 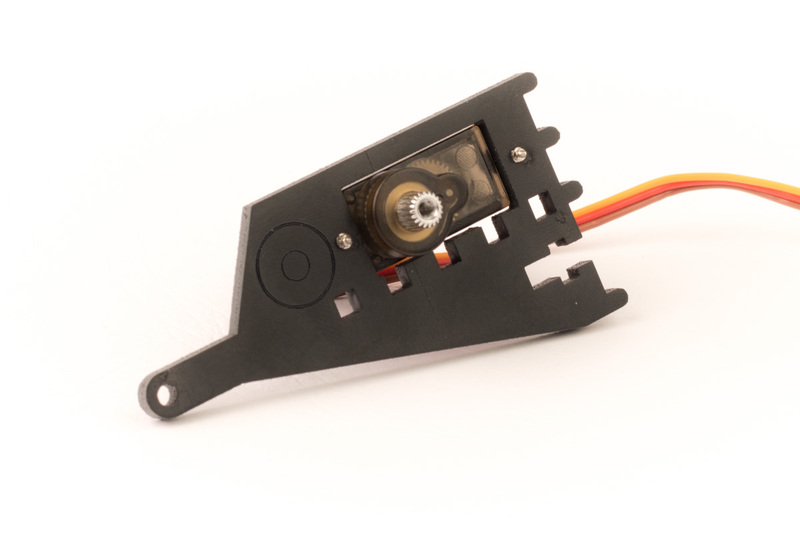 The side plate should be connected on right next to the servo. 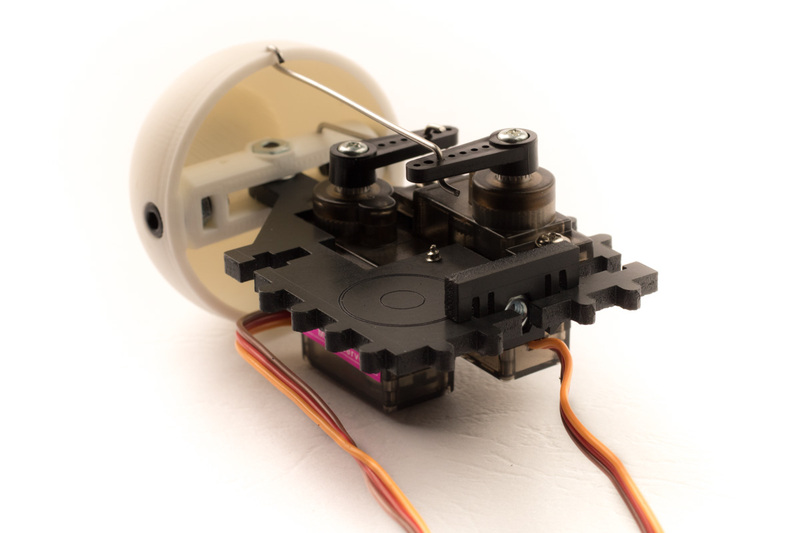 Attach a servo to the remaining side plate, as shown in the picture. 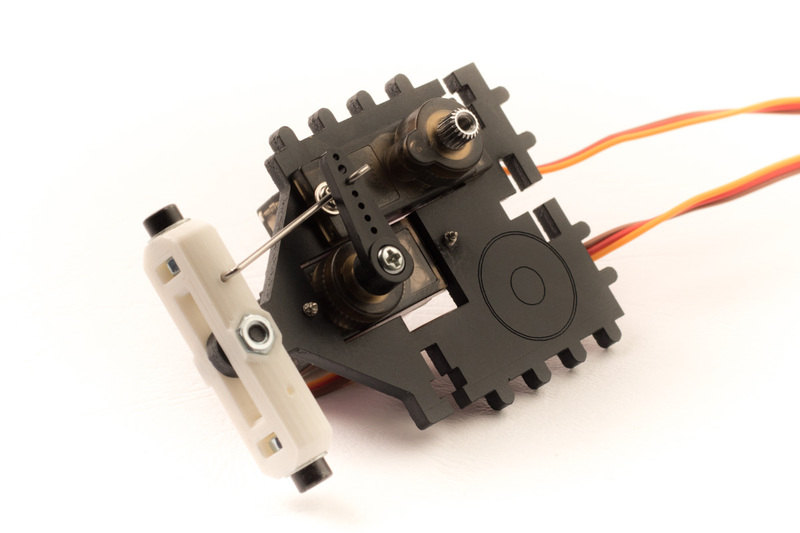 The servo should be attached from the back of the of the plate and the servo&apos;s output shaft should be oriented towards the front of the module. Slip the cable of the servo through the rectangular opening of the mid plate. Then, attach the side plate to the rest of the module using an M3 nut and an M3x10 screw. There should be two remaining push rods. Attach one of them to the short end of an eyelid. Attach the other to the long end of the other eyelid. The push rods should be able to rotate freely. The eyelids are asymmetrical, the hinge feature of the eyelid is shorter on one side and longer on the other side. Because of this, the same part can be used for both upper and lower eyelid. The long hinge of one eyelid should overlap with the short hinge of the other eyelid. The levers on the eyelids should be pointing backwards. The push rods should be located on the side of the servo. Slip the ends of the push rods through the fourth and fifth hole of a servo horn (counting from the tip). 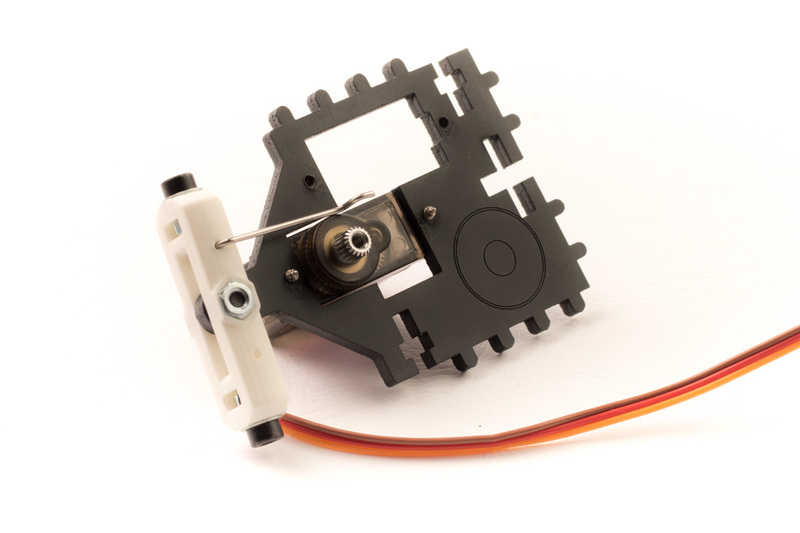 Attach the servo horn to the servo using the included screw. Congratulations, the eye module is now ready!